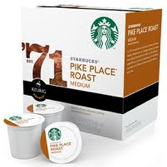 Hurry and request your free Starbucks K-Cup sample pack from Target.com. Bummer Target/Starbucks. if you answer that you’ve ever purchased k-cups before, you don’t qualify for the sample. Dear Target, why would I want a sample if I didn’t already own a Keurig AND therefore have purchased k-cups before. Disappointed. Thanks for letting us know, though, MSM! I picked “yes” as we’ve had a Keurig machine for 3 or so years now and I didn’t have a problem proceeding with the sample request. I got the same thing, i picked yes and it said i didn’t qualify for the free sample. I was having trouble getting past question one too, even after trying several different browsers. Then I went ahead and successfully requested the Fructis sample on the same page, and after that it suddenly allowed me to take the Starbucks survey and request that sample as well…maybe this is something you can try. Also, you do have to answer “no” to question 2 for it to allow you through. Clearing out my cookies/Temp. Int. files seems to have done the trick for me. Before that, it was just hanging on the first question. I had the same issue, I clicked yes I purchased Starbucks before, (which I had but for a friend,NOT ME). I went back & clicked NO & it let me continue through. It won’t even start up the survey now; it just freezes. Looks like the word is out!